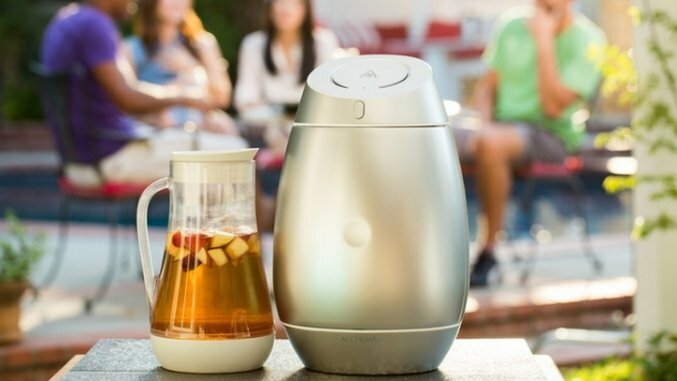 That’s the simple tale of how Alchema, a newly launched Kickstarter for a smart home brewing system for those who want to make their own cider came to be. A countertop system, you simply choose a recipe from the Alchema app, add the ingredients with the machine’s built-in weight sensor, and the device does the rest for you. Monitoring various key parameters, it’ll communicate with the app to let you know when the time is right for the next brew. It works a lot like a conventional coffee maker, ensuring that anyone can master the device. The process takes around two weeks, depending on your choice of fruits, with the drink manufactured through simple ingredients including sugar, water and yeast. That means there’s the benefit of a natural yet delicious drink at the end. Chang came up with the idea by determining three reasons why it’s hard for beginners to homebrew. He focused on the sanitization process, ensuring that Alchema is equipped with medical-degree UV-C LED light to sanitize the container within 30 seconds. Timing is crucial too, with Alchema keeping an eye on exactly when the process needs to be terminated. “Alchema has sensors and algorithm to notify you through the app when it reaches your desired sweetness and alcohol content,” Chang says. Throughout, Alchema is sealed to prevent contamination, while still monitoring the air pressure for any potential issues. The aim being that “people can enjoy the fun and creativity of homebrewing, rather than cleaning up a mess.” Due to its seal, you won’t have to worry about the lid blowing off and causing a minor (but messy) explosion— a common issue for the novice homebrewer. Alchema isn’t just down to Chang’s hard work. One of its co-founders, Hanning Tung, has a Masters degree from the University of Sheffield in the UK, having also worked in two different breweries in the country. Between them, they’ve been homebrewing with different fruits and recipes since 2014, before handpicking the 10 best recipes to launch on the Alchema app. Chang mentions Strawberry Raspberry cider as one particular highlight available to owners. While the focus is on producing hard cider, it’s also possible to use Alchema to make mead and wine, with the latter taking about 12-16 weeks. The beauty here is the hands-off approach, meaning you don’t have to keep checking on how things are progressing. Alchema will tell you when it’s ready. It’ll even inform you of exactly what alcohol level your drink is currently resting at, so you know just how strong it is. Having just launched on Kickstarter, Chang is hopeful that Alchema garners the same level of success as other related projects on the site. To acquire an Alchema unit along with 3 yeast packets to start you off, early bird pledges start at $329, with shipping scheduled for July 2017. Each yeast packet will provide one round of cider (about 0.6 gal or 2.4L) A stretch goal has been arranged to guarantee an Android version of the app, with the current focus being placed on the iOS app. Currently, Alchema is available to ship to the USA, Canada and Taiwan. The campaign ends September 9.